It has been about a year now since I have started working in the new studio. So much has changed for me in the past three years since I essentially grew out of my old shop and home that it would be impossible to just keep doing the same old thing. Initially I wanted to do a grandfather clock since I now have the space that would allow working on a scale four time larger than what I have done in the past. One thing I’ve learned is that I’m going to have to work my way up to the size and “presence” of a clock on such a grand scale. Six feet tall, human scale proportion. What I have been doing this summer is working with some of the design concepts and construction techniques of the grandfather designs, and working through them in the smaller scale I am more familiar with. This first design uses a different method of construction. Instead of the mitered corner “box” I normally do, this design utilized more of a “leg” design, an internal box suspended on the corners by legs lifting it off the ground. This design utilizes the tapered sides that wraps up into the top, with the legs supporting the corners. I feel it has a strong architectural feel with references to a cathedral or mission design. This first study was executed in alder with a black dye. I am pretty pleased with the proportions and looking forward to trying it in quartersawn oak. 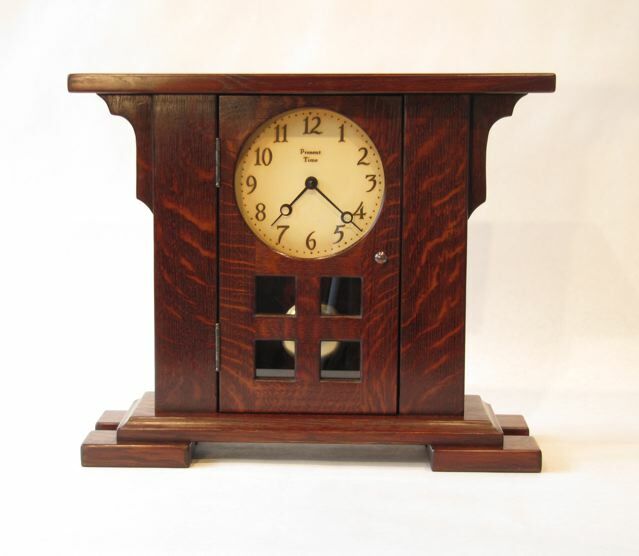 This next design has a familiar silhouette to the Column clock, but on a much larger scale. It utilizes the new 7″ face and stands 26″ tall. The grill design detail on the door comes from a simplified plant or tulip design I have worked with in the past. It seemed like the perfect place to use it. This clock is just calling for the mechanical movement with a deep coil gong . 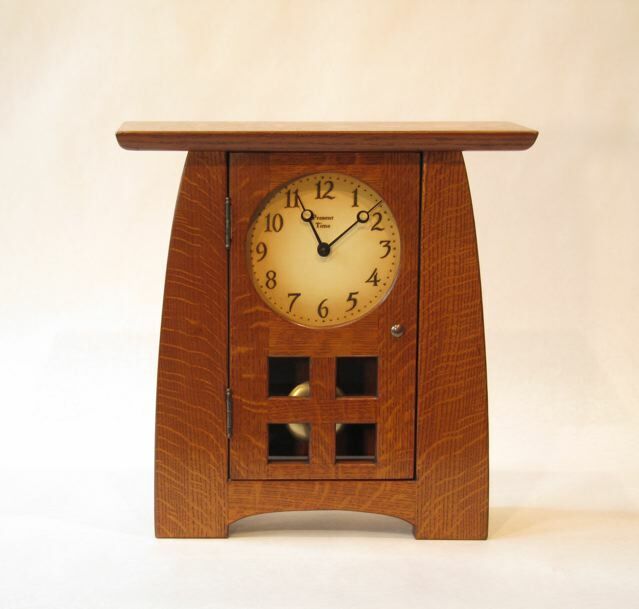 . .
Another design is based on the Highland design I have worked with from my very first clocks designs. This is a lower, wider version with a round dial and an opening door. This design is working it’s way to a low, wide mantle clock design. The change will require to redesign the chime rod soundboard from the back of the clock to the base. It will require a completely different method of construction, so it will have to wait a bit before I can get to it. 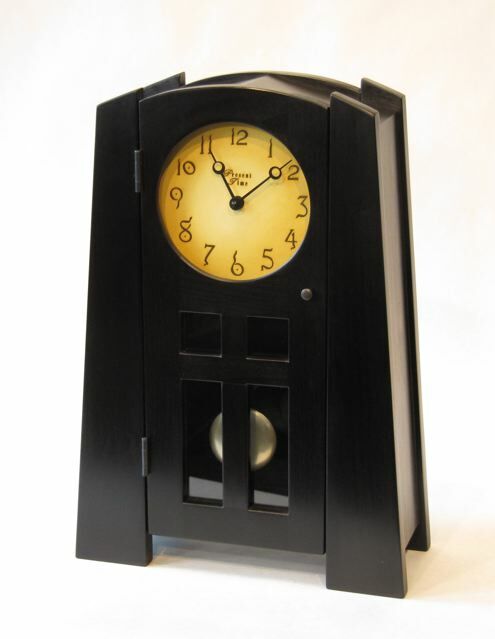 The last design is simply a new door and grill design for the larger Buffalo clock. I do have some method to my names. The Arroyo clocks all have tapered sides, like the letter “A”. The Highlands have perpendicular sides and kind of have the look of the letter “H”. The Buffalos all have curved sides sort of like the letter “B” turned on it’s side. The black clock is a little different. It has a similar feel to the Santa Barbara clock I did years before, which was named after the mission in Santa Barbara, for no reason other than it reminded me of it. I’m thinking of another mission name, maybe San Jose? 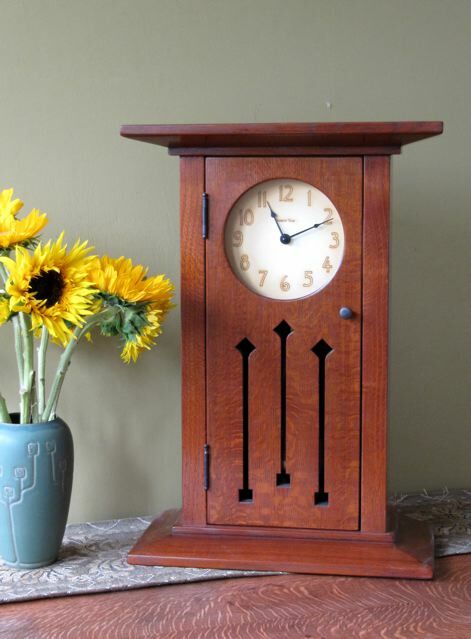 The large clock has a feel of prairie design and needs something to distinguish it from my other Prairie/Column clocks. I give up for now, I’d rather make them than name them. I’m open to suggestions. It is now less than two weeks before my show in Seattle and I’ve got plenty more work to do, so I’d best wrap this up now. This entry was posted on Sunday, September 12th, 2010 at 6:40 pm	and is filed under Uncategorized. You can follow any responses to this entry through the RSS 2.0 feed. You can leave a response, or trackback from your own site.